Käsespätzle (Kaesespaetzle in the spelling without the umlaut) are a casserole made of Spätzle (fresh German egg noodles), cheese and browned onions. They are true comfort food, flavorful and simple to prepare (except for making the Spätzle which can be done well in advance). Set heavy pan over high heat. Add butter and olive oil. Add onions. Cook over high heat until the onions start to brown. Stir frequently. Reduce heat. Add salt. Cook onions until soft and golden brown, ca. 20 minutes. Stir frequently and scrape the juices off the bottom of the pan. 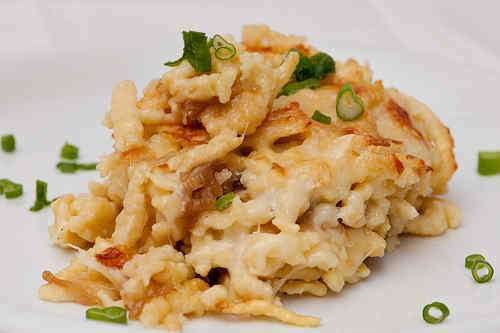 Place a layer of Spätzle in the form, put browned onions on top, then add a layer of grated cheese. Repeat until Spätzle, onions and cheese have been used up, make sure to finish with a cheese layer. Bake in the oven until the cheese has melted and starts to brown on the top, ca. 20-25 minutes. Use flavorful cheese like Gruyere or Comte. You can prepare everything in advance, keep the dish refrigerated and just place it in the oven before serving. The Umlaut-less spelling is "Kaesespaetzle"
I just stumbled on your website while looking for ideas on spaetzle! You are doing a lovely job here and I am excited to give your spaetzle a try... I have never made it before. Thank you for the inspiration and keep up the good work! mmm... It looks very tasty. I'd love to try Käsespätzle. As for me, I've never been to Germany and I know about its cuisine very little. I've cooked a lot from Italian cuisine, because it is easy to find recipes. I usually use the videos with Jimie Oliver. I download them regularly from shared files SE http://filecraft.com . I like the dished Jimie Oliver chooses. They are easy to prepare. But now it it turn of Käsespätzle. I'm very glad I've found the recipe. I feel that it will be very delicious. This looks absolutely delicious! I like the fact that you're using egg noodles, because I'm sick of the ordinary plain egg noodle dish that I create. This one looks flavorful, and creative. Mine is bland and looks like I made it straight out of the box. I also wind up drowning it in butter or fat to make it taste better. Eating my dish you'll need medical insurance, eating your dish you will probably loose weight lol.